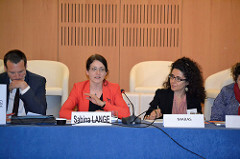 On the 30-31 of May 2016, more than 80 researchers and policy analysts from think tanks and academia met in Paris at the Austrian Embassy and the French Institute for International Relations (IFRI). Participants from all EU member states and the six Western Balkans countries were invited. The Reflection Forum was organised in an innovative manner allowing for an open and direct exchange around four key thematic areas related to the priorities of the process of EU integration. It provided a platform in order to broaden the reflection about the regional developments among the policy community, the media and the general public. Four thematic sets of questions were discussed in relation to the ‘Berlin-Vienna-Paris’ and the accession processes: (i) social-economic convergence of the region with the EU, (ii) mobility, migration and border security, (iii) democracy and good governance, and (iv) the future of the EU and Western Balkans in it. Please click here to view a video of the proceedings.